Nickelodeon Suites Resort–Orlando’s Best Kids Resort? The Lagoon Pool, center of most of the action. After spending the weekend at Nickelodeon Suites Resort with our 5-year old granddaughter, I’m convinced the Nick Hotel is probably Orlando’s best resort for youngsters 5-12 years. The almost non-stop daytime activity is well coordinated so there’s always something to look forward to, including frequent appearances by such iconic Nick characters as SpongeBob SquarePants, Dora the Explorer and the Teenage Mutant Ninja Turtles. And the slides and flumes at the Lagoon Pool water park are ready and waiting throughout the afternoons. Our granddaughter Harper may be only 5 but she’s a theme park pro. She started visiting Disney World regularly at the age of 2 and has been to all the other major theme parks at least once and frequently more. With that kind of background, we didn’t expect such an enthusiastic reaction when she first enters our suite. “Look–SpongeBob is painted on the wall!” Harper shrieked happily. “I have a SpongeBob bedroom!” The cartoon art not only makes her excited but it’s also a little overwhelming. Later, when she turns on the TV in her room, the channel is tuned to the Ninja Turtles on Nick TV. She immediately starts imitating their moves, watching intently to copy them perfectly. Harper is in her own happy world. To Shake Hands Or Not To Shake? However, SpongeBob-in-person proves to be a little overwhelming Saturday morning at a special meet and greet with the famous cartoon character. Normally very gregarious, Harper is intimidated when she comes face to face with the famous TV star. It takes a lot of coaxing to have her stand next to the big yellow kitchen sponge to pose for a picture. 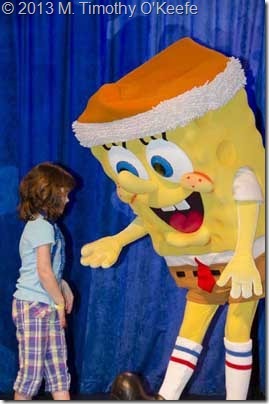 A short time later we attend the Nicktoons Cafe character breakfast where SpongeBob and the other Bikini Bottom characters put on a show and then meander among the tables. It’s a harmless dance and hardly aggressive but Harper again finds it all a little overpowering. She’s never been able to spend so much time up close with the characters at Disney or anywhere else. The buffet’s offerings are complete enough to satisfy even Harper’s finicky food likes. The character buffet ($24 adults, $14 ages 4-12) is impressive, more than I expect: various cheeses, sliced European breakfast meats, trays of pastas, fresh fruit, smoked salmon, tuna fish salad, eggs to order including Eggs Benedict, breakfast burrito, bacon, sausage, corned beef hash, cereals, yogurts, bagels, donut holes, muffins croissants, cherry blintzes and more than I care to write down or remember. Afterwards, it’s time to introduce Harper to the Lagoon Pool and its water park rides. Harper attacks the rides with enthusiasm. Although the air temps are only in the high 70’s, the large pool stays a comfortable 84 degrees as does the water flowing through the seven different slides and flumes. The rides start at different levels of a four-story water tower also featuring climbing nets, water jets and a 400-gallon dump tank, which dumps occasionally throughout the day. In the afternoon, during the special Mass Sliming, it pours a lot of slime-colored water on eager bathers ready to turn green. Slime is a famous Nickelodeon trademark dating back to a 1982 TV show You Can’t Do That On Television. Although sliming opportunities are frequent, you may have to pay a charge to participate. The only times and place we witness sliming is at the Lagoon Pool during special events. Harper proves she’s over her “fear of characters” on Saturday evening after we walk by the entrance of the Nicktoons Café, which is featuring Ninja Turtles character dining. Linda glances through the door and notices it’s almost empty. “People have left their masks on the tables. If they don’t want one, maybe I can get one.” Why not, it never hurts to ask. 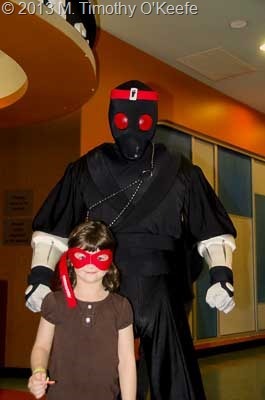 She enters the dining room and asks for a red mask like the one worn by Raphael, Harper’s favorite Ninja turtle. Linda returns with one, reporting, “They couldn’t have been nicer.” The mask is really nothing more than a red strip with eyeholes but exactly like the turtles wear. To Harper, it’s a priceless possession. As we start to leave, a Ninja in black with red eyes but no mask suddenly appears, ready to pose for photos. We tie the mask on Harper, who rushes eagerly to meet the Ninja figure. That night, Harper doesn’t wear the mask to bed but sleeps with it clutched beside her. Even for this young theme park pro, something so simple is incredibly special. Like the rest of everything she experienced that weekend. 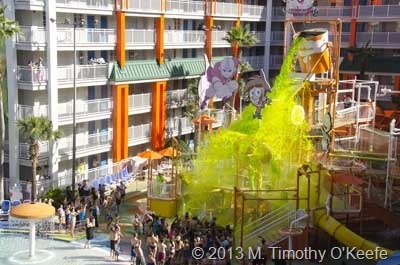 Orlando’s Nickelodeon Suites Hotel, the only one in the world, is a huge property with 777 rooms covering 24 acres. The all-suites hotel includes one to three bedrooms, kitchenettes and TVs in the living room and each bedroom. Our two bedroom SpongeBob suite included a master bedroom with a king bed and a separate kids bedroom (without a door) containing bunk beds. The living room sofa was a pullout, so the room could have accommodated six. The kitchenette had a microwave and mini fridge but no dishes or silverware; bring your own if you intend to make meals during your stay. Which you might want to do. 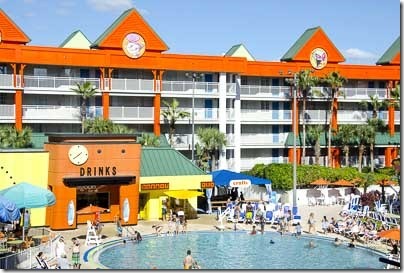 Nickelodeon Suites Resort has limited dining options, all housed in the main activity known as The Mall. The Mall definitely could use another restaurant for those who spend all their time at the hotel. Breakfast has the most choices with either a character breakfast at the Nicktoons Café or dining at the breakfast-only Main Buffet ($11.95). The Mall’s food court has a Subway (offers breakfast subs), Cravings which features Starbucks but not much food and Antonio’s Pizza, which also serves burgers, hot dogs and chicken sandwiches. The hotel pools also have their own grill restaurant that close at 5. Selections are sparse on Saturday evenings when Nicktoons Café offers only character dining; and pizza and burgers do become monotonous. . The hotel provides transportation to all the major theme parks as part of the $30 daily mandatory resort use fee added on top of the room cost. Although I dislike any resort use fee, it may be worth it this time since it also covers free admission to live shows and entertainment, the two water parks, wireless room internet, unlimited local telephone calls and free parking. Just the parking at some theme park hotels is $17 a day.